Our first Nancarrow wedding of the year was upon us before we even knew where we were. There used to be a wedding season and you could confidently plan in advance the peak dates, these days there isn’t really a season, with our last wedding in December and now here we are, just two months later. Weddings can be unpredictable, we love unpredictable and we loved Patrick and Anna’s big day due to it being little out of the norm. 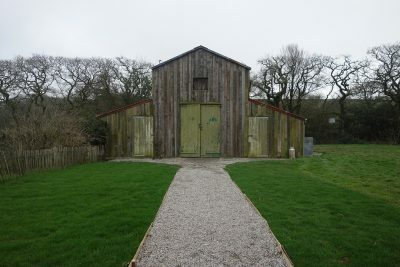 Nancarrow Farm have recently opened up what they are calling the “Rusty Barn”, an organic space that they are using for ceremonies and pre-meal drinks for the bridal party and invited guests. As we have a great ongoing working relationship with the team at the farm, we were more than happy to supply them with one of our wireless Bluetooth speaker systems when asked. This means they can now provide visitors with beautiful sounding background music until they are able to source a more permanent installation. It was also good to kick things off working alongside fellow Nancarrow recommendation Ross Talling. Working with a photographer that understands we can customise our lighting to suit the shot they want is always rewarding and Ross knows he can rely on us to achieve this. I’d just like to say thank you for your hard work on Saturday. We had a great party and everyone loved the music. I hope you had a good evening too. We’ll certainly be recommending you to friends and family, but we also want to give you feedback for anyone else to read. 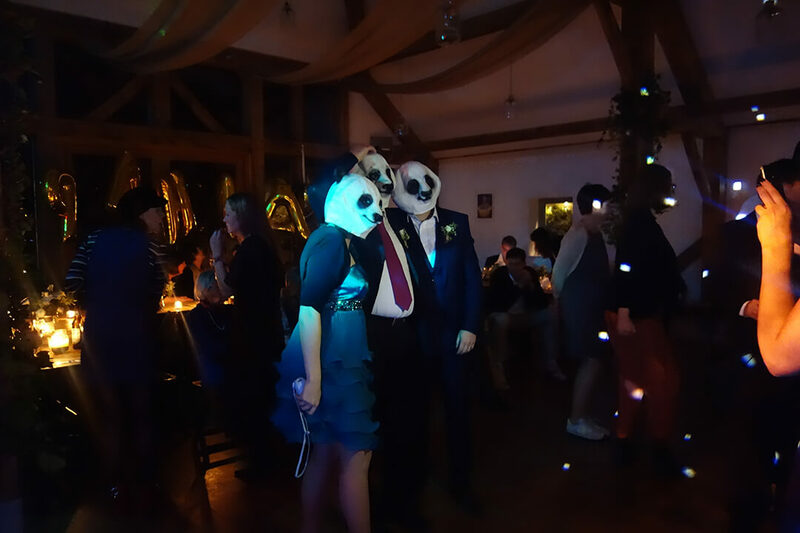 The new Mr. and Mrs. Zeuss contacted us upon recommendation from Nancarrow and it was obvious from the initial enquiry they didn’t just want a bog-standard DJ for the reception. An early setup was required, which we usually do on the Friday afternoon prior to the wedding, so they could have music all day and use of wireless microphones for the speeches, but it didn’t stop there. Our versatility meant we didn’t bat an eyelid when Patrick (who is of German heritage) wanted to include some songs that were in his native language for him and the invited German contingent. Being a real music nerd, I’m always excited at the prospect of being introduced to a world of music that wouldn’t naturally be on my radar! Of course, there were a few tracks that would be known to 80’s music lovers from the likes of Falco and the original “non-English” version of Nena’s classic anti-war anthem 99 Red Balloons. I still think this punk cover is fantastic though! But then there were some other great songs I’d never heard before from hip hop outfit Fanta 4 and the hugely popular German singer Andreas Bourani. Not only was there the requirement for us to source some of these more difficult to come by tracks, there was a surprise planned for the first dance which we were more than happy to accommodate. Family and friends contributed to the spotlight moment of the newlyweds by doing a live rendition of “When You Say Nothing At All” by Ronan Keating and it was a great chance to hire out our rather lovely sounding full 88 key Roland digital piano. We also included a couple of mic stands and wireless microphones for the collected background singers, a live mixer for the guitarist to plug into and had yours truly twiddling the knobs. This all resulted in a rather emotional and meaningful way for the newlyweds to take to the dancefloor as man and wife for the first time. To start the party, Patrick suggested a dancefloor filling song from his submitted playlist, so we kept the applause going at the end of the first dance and hit play on, wait for it, The Macarena! Don’t judge me! It was a fun and enjoyable way to get young and old up and into the party spirit and it worked like a charm. 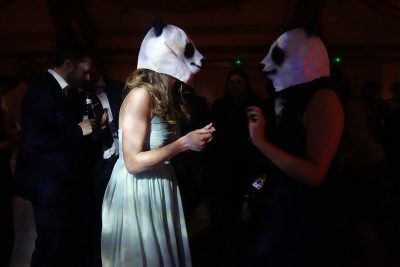 Random moment of the night was when a panda mask started doing the rounds with guests on the dance floor, obviously inspired by the couple’s initials P and A! We are heading to Truro again next Saturday for another Nancarrow wedding, this time just an equipment hire. With plenty more dates already booked through the year at the farm, it looks like we are going to be kept busy with similarly unpredictable events in 2017. If you are planning a Nancarrow Farm wedding and would like us to be a part of your celebration, please contact us for more details.